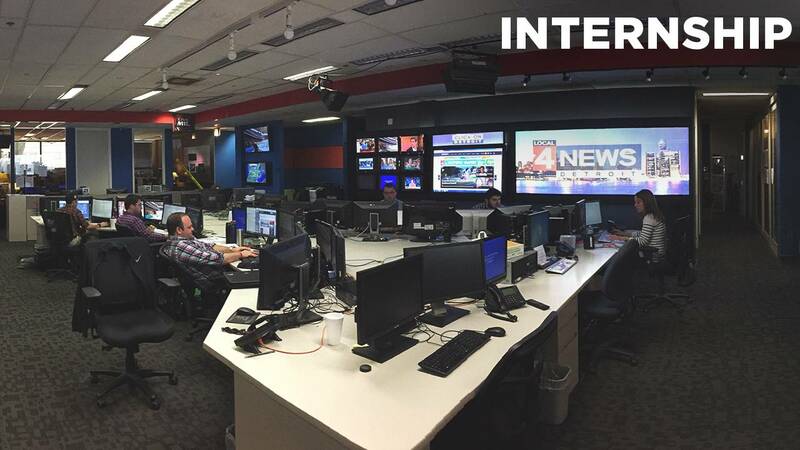 The internship program at WDIV-TV Local 4 is designed to offer a meaningful field experience related to an individual’s particular area of interest in Broadcast Communications. *We are no longer accepting applications for the spring/summer semester. Emphasis is placed on offering the intern a variety of hands-on experiences within the department for which they are selected. Intern assignments depend upon the specific needs of each department. The internships are paid positions. The applicant must be eligible to earn credits from his or her college/university or the equivalency if a trade/technical school. Local 4 tries to be flexible with schedules in order to accommodate the student’s requirements, as well as those of the department. All interns must be highly motivated and able to work independently on assigned tasks. Interested candidates should apply several months prior to the semester in which they hope to work. The internship application below must be completed and approved prior to the start of the internship. The program is coordinated through the Human Resources Department. Interested candidates will be referred to the various departments for interviews and selection is based on the intern’s interest and qualifications. WDIV is an Equal Opportunity Employer. In addition to complying with the requirements of federal law, WDIV will comply with applicable state and local laws prohibiting employment discrimination. Any offer of employment is conditional on successful completion of a pre-employment drug screen, investigative background check, employment/education verifications and reference checks. Included is a brief outline of the programs within each department. 1. Participants will receive compensation and, at the discretion of the department coordinator, receive reimbursement for expenses incurred while working. However, interns will not accrue any employee benefits. 2. The duration of participation by any one student shall not exceed one semester or other single segment of a school term. 3. Interns shall not serve for more than 8 hours a day or 24 hours per week. 4. The department coordinator at the station will provide such reasonable reports and evaluations on the intern’s performance as the intern’s school may require for course credit. Copies of all correspondence related to such performance will be kept on file by Human Resources at WDIV-TV. 1. Be at least 18 years of age. 2. Be enrolled in an accredited college or university and classified as at least a “junior” status when internship begins. Technical school participants must apply within three months after graduation. 3. Be majoring in communications, journalism, electronic media or some other field having a direct relationship to broadcasting when applying for a News, Programming or Creative Services internship; be majoring in marketing or communications for a Sales internship; and be majoring in information technology, computer engineering or computer programming for an IT/Engineering internship. 4. Be eligible to earn course credits for the paid internship or their equivalent (such as a Master’s Thesis) or be part the continued learning experience through a trade/technical school such as Specs Howard. 5. Fill out and submit the internship application online. 7. Upload a cover letter, stating why you want to do an internship at Local 4. 8. Upload a statement from your school's Internship Supervisor stating that you are approved for course credit for this paid internship and stating how many credits you will earn. Also we need to know what requirements, if any, must be met by WDIV. You will be contacted when there is an available opening in the Internship Program. Each semester Local 4 offers internships in the newsroom. It’s a wonderful chance to learn the business from the inside by experiencing how a newsroom works in the nation’s 11th largest market. We believe News internships are a valuable supplement to your classroom experience. Local 4 internships are more journalism-oriented than production-oriented. Interns work in news gathering, however, they are not able to do any hands-on work with equipment. Each intern will go out with a reporter a few times during a semester, but most of the time will be needed inside the newsroom. A compelling interest in news. ASSIGNMENT DESK: This is the nerve center of the newsroom. The desk keeps on top of breaking and continuing news stories, assigns and dispatches crews and reporters. Interns on the desk gather news for daily stories, screen incoming news stories for reporters, check in several times daily with police stations for news, watch/listen to other media outlets. If you want to learn how news judgments are made and be in the center of the action, this internship is for you. SPORTS: This unit is responsible for the sports segment of each newscast. Interns watch sporting events – often multiple events at once – log plays and assist in selecting highlights, monitor sports wires and find file video. This internship is only for hard-core sports fans. GOOD HEALTH: Work on production of nightly Good Health segments. SPECIAL PROJECTS: This unit works on news series, documentaries, election coverage and other special events that are not daily breaking news stories. Interns here get an in-depth look at what it takes to develop and research a series. Most of the interns’ time is spent in research, follow-up of story ideas, phone interviewing, logging tapes and assisting a reporter or producer. If you’re a detail person, like to work in-depth on one subject and have good interviewing skills, this internship is for you. CLICKONDETROIT.COM: This unit is responsible for website news service. Not prepare a resume tape. TV is constantly evolving. Do you want to be a part of that evolution? We’re looking for people who are smart (not just book smart) and want to contribute to the conversation of how we view content, create it and market it. Creative Services interns are hard-working and detail-oriented individuals who want to gain valuable experience in the television/media industry. They are curious and are passionate about how media companies work and want to explore career interests. What’s so important about local TV? Local journalists and producers of local programming are crucial to telling the stories that make up our communities. Position Summary: The Creative Services team is the marketing and design department for Local 4. We promote local and NBC programming, syndication and online. The ideal candidate possesses excellent written and verbal communication skills, has the ability to multi-task, works well under pressure and takes initiative. Creative thinkers are essential. Help us reach new audiences and strengthen the relationships with our current viewers. Responsibilities include monitoring Local 4’s website - ClickOnDetroit.com, monitoring WDIV apps, screening and logging video, assisting with press releases, attending promotional events and helping producers with day-to-day needs. Requirements: Undergraduate (junior/senior standing) student attending an accredited college or university majoring in Communications/Marketing/Journalism/Broadcasting or a related field of study. Students must be able to obtain college credit for the internship experience. Students should have a strong academic record (GPA of at least a 3.0 is strongly preferred). Duration/Hours: Must be able to work 24 hours per week between the hours of 10 a.m. – 6 p.m. (Mon-Fri) during a 13-18 week period. Note: Some special projects may require working nights and/or weekends. If you have any questions about an internship in the Creative Services department please contact Donna Harper at 313 222 0643. Stories can be told in many different ways. Do you have a vision? Each fall and summer semester [not available winter semester] students are exposed to all aspects of local TV production -- from concept to air. WDIV-TV’s award-winning local specials are highly regarded as innovative trend-setting productions. Our interns are a part of that process and we hope they leave here with a well-rounded foundation of the skills and knowledge that will help them compete successfully in the entry-level job market. Producers of local programming bring to light the stories of people, places and things going on in our communities we might not otherwise see. Position Summary: Local 4 is known as the “Big Event” station. The Programming/Production team brings these big local events to our on-air and mobile viewers -- the three-hour special event broadcast of America’s Thanksgiving Parade, the two-hour primetime Fireworks special, the weekly public affairs program Flashpoint, the newsmagazine First Block, the Arts Beats & Eats special, annual Auto Show coverage and more. The ideal candidate possesses strong communication skills; has excellent journalistic, organizational and research skills; a compelling interest in television either as an entertainment form or as an information source; and has had exposure to the business of television and/or journalism through college classes. Responsibilities included research, assisting during field production shoots and studio tapings, writing scripts, booking guests and contributing to the many other facets of show productions. Requirement: Undergraduate (junior/senior standing) student attending an accredited college or university majoring in Communications/Marketing/Journalism/Broadcasting or a related field of study. Students must be able to obtain college credit for the internship experience. Duration/Hours: Must be able to work 24 hours per week between the hours of 10 a.m. – 6 p.m. (Mon-Fri) during a 13-18 week period. Note: Some special projects may require working nights and/or weekends. Are you passionate about what’s happening in our community? LIVE In The D showcases fun, interesting, and topical events in our community. It’s a mix of talk, lifestyle, entertainment and information presented in an engaging style. The show airs live Monday through Friday from 10am – 11am. Each semester our interns are exposed to all aspects of local TV production -- from concept to air. We hope they leave here with a well-rounded foundation of the skills and knowledge that will help them compete successfully in the entry-level job market. Position Summary: The ideal candidate possesses strong communication skills; has an excellent understanding of digital/social media; strong journalistic, organizational and research skills; a compelling interest in television and digital media either as an entertainment form or as an information source; and has had exposure to the business of television and/or journalism through college classes. Responsibilities include assisting daily show production, regular digital postings, field production shoots, writing scripts, booking and coordinating guests and contributing to the many other facets of the show. Requirements: Undergraduate (junior/senior standing) student attending an accredited college or university majoring in Communications/Digital Media/ Journalism/Broadcasting or a related field of study. Students must be able to obtain college credit for the internship experience. Duration/Hours: Must be able to work 24 hours per week between the hours of 7am -3pm. (Mon-Fri) during a 13-18 week period. Note: Some special projects may require working nights and/or weekends. If you have questions about an internship with LIVE In The D please contact: Tammy Sortor, tsortor@wdiv.com or Jay Kuhlman, jkuhlman@wdiv.com. Each semester an internship program in the Local 4 Sales department will be offered to a college-level student with the opportunity to learn the business from the inside. The intern will experience first-hand the process of how television sales develop from beginning to the end. To attend client lunches or dinners. To attend media parties or social events on behalf of Local 4. Background: IT Broadcast Engineering is a unique and exciting field at the heart of the modern television facility, combining aspects of Electrical/Computer Engineering, Computer Science, and enterprise IT. Engineering interns will have the opportunity to develop skills in the areas of systems architecture, networking and programming to learn how these are applied in television production. Interns will also gain hands-on experience with broadcast equipment used in producing newscasts and entertainment programs. Applicants should have a course curriculum in Engineering or Computer Science, a passion and curiosity for technical learning, strong analytical reasoning and communication skills, and the ability to work autonomously or in teams.